When only the best will do! 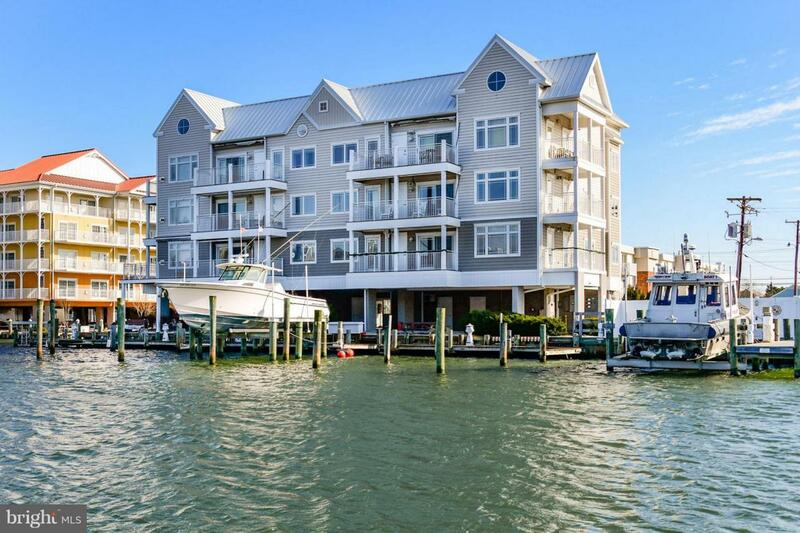 Aronimink #301 is arguably one of the nicest waterfront condos in all of Ocean City that conveys with two slips, one being a 50~ deep-water slip and the second a 25~ slip with lift. Its top floor, end unit location offers the best placement in the building with southern exposure and great views of the open bay, harbor, and marina. The condo presents a unique and well-thought-out floor plan with high-end appointments and features throughout. The large living room boasts cathedral ceilings, gas fireplace and lots of windows for great light and views. The gourmet kitchen offers custom cabinets, granite tops and stainless-steel appliances. A welcoming dining area adjoins the kitchen and living room to round out the living space. The split bedroom configuration has a large, waterfront master suite with master bathroom and two additional, generously sized guest bedrooms with their own full bathroom and a half bathroom. Interior appointments include Brazilian hardwood and tile floors, GE profile appliances, tray ceilings, crown moldings, granite tops, beautiful tile work and much more. For outdoor living there are two decks with electric awnings that are perfect for relaxing after a long day on the water or at the beach. Aronimink is a small six-unit building that offers a secure lobby, elevator and privacy at the end of 13th St. This is a special property for the discerning buyer that wants the ultimate in waterfront living.